We are a customer oriented system that provides safe, dependable and responsive services through positive interactions. Greeley-Evans Transit makes every effort to operate according to the schedule and routing as advertised. However, occasionally there are circumstances such as construction projects, traffic congestion, weather, passenger assistance and others that prevent GET from maintaining the schedules. In no event shall Greeley-Evans Transit be held liable for late operation or disruptions of service. All items left on bus will be placed in the Lost and Found. Items may be claimed no earlier than the next business day at the Greeley-Evans Transit office or by calling 970-350-9287. After two weeks unclaimed items will be donated to charity or destroyed. Greeley-Evans Transit is not responsible for items left on any transit vehicles. In accordance with the provisions of the Americans with Disabilities Act of 1990 and the Civil Rights Act of 1964, Greeley-Evans Transit designs and operates services and programs without regard to, and does not discriminate on the basis of race, color, or national origin, and no person shall be excluded from participation in, be denied the benefits of, or be subjected to discrimination under any program or activity. For more information about Greeley-Evans Transit’s commitment to non-discrimination, please contact us. Information in non-English alternative formats can be obtained through the offices of Greeley-Evans Transit. Individuals will be permitted to use service animals as defined within the Americans with Disabilities Act guidelines, if necessary. Greeley-Evans Transit (GET) provides services without regard to race, color, or national origin, according to the provision contained in Title VI of the Civil Rights Act of 1964, the Rehabilitation Act of 1973, as amended, the Americans with Disabilities Act of 1990, and Federal Actions to Address Environmental Justice in Minority Populations and Low-Income Populations (Executive Order 12898). To request additional information on GET’s Title VI/Nondiscrimination policy or to file a discrimination complaint, please contact GET’s Title VI coordinator at 970-350-9751. Greeley-Evans Transit se compromete a asegurar que ninguna persona sea excluìda en la participación o sea denegada de beneficios en la operación del sistema de transportación pública basada en raza, color, nacionalidad o ninguna otra categorìa protejida por ley, incluyendo Tìtulo VI del Acta de Derechos Civiles del 1964, enmendada. Además, en el Acta de Personas con Incapacidad del 1990, ninguma entidad debe discriminar contra individuos con incapacidad fìsica o mental relacionada con la provisión de servicios de transportación. Puede someter una queja durante los primeros 180 dìas después desde el dìa en que ocurrió la discriminación. La queja debe incluir la siguiente información: nombre, dirección y contacto; cómo, cuándo, dónde y por qué usted cree que se ha discriminado en su contra. For any person who believes he or she has been discriminated against under Title VI of the Civil Rights Act and desires to file a complaint, we encourage you to file a complaint or contact us. Limited English Proficiency (LEP) Plan has been prepared to address the responsibilities of the City of Greeley, Colorado, dba Greeley-Evans Transit (GET) as a recipient of federal financial assistance as they relate to the needs of individuals with limited English language skills. The plan has been prepared in accordance with Title VI of the Civil Rights Act of 1964, Federal Transit Administration Circular 4702.1A dated October 2012, which state that no person shall be subjected to discrimination on the basis of race, color or national origin. 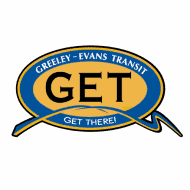 The City of Greeley Transit Services Division, doing business as Greeley-Evans Transit(GET), has established a Disadvantaged Business Enterprise (DBE) program in accordance with regulations of the U.S. Department of Transportation (FTA/DOT), 49 CFR Part 26. The City of Greeley dba GET has received Federal financial assistance from the Department of Transportation, and as a condition of receiving this assistance, the City of Greeley dba GET has signed an assurance that it will comply with 49 CFR Part 26. Greeley-Evans Transit is committed to providing safe, reliable, courteous, accessible and user-friendly services to its customers. To ensure equality and fairness, Greeley-Evans Transit is committed to making reasonable modifications to its policies, practices and procedures to avoid discrimination and ensure programs and services are accessible to individuals with disabilities. Requests for modifications can be made by calling 970-350-9290 or emailing Leiton.Powell@greeleygov.com. Information found on this website can be provided in an alternative format upon request. Please contact Customer Service at 970-350-9290 to speak to a representative or email the Accessibility Coordinator at Leiton.powell@greeleygov.com. Greeley-Evans Transit will do its best to provide the requested alternative format within a reasonable time. Get a free ride to school, to activities, or back home. 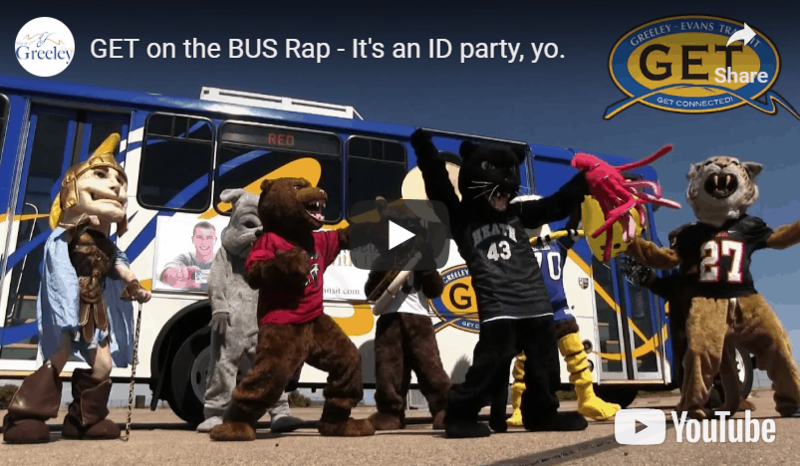 To ride, show the driver a state issued ID or a current school year student ID for any elementary, middle, or high school (including District 6 GAP students) in Greeley or Evans. Check our our Get Around Greeley flyer for more information. This program is part of our GTown Promise.